Every summer, families and outdoor adventurers head to the mountains of Virginia to escape the heat and play in the great outdoors. 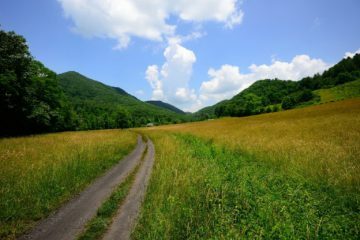 The Alleghany Highlands, located west of the Shenandoah Valley along the border with West Virginia has carefully cultivated its reputation as a welcoming destination for outdoor enthusiasts. Especially popular during the summer months is water recreation on the Alleghany Highlands Blueway. This unique blueway combines two rivers and two lakes, which means kayakers, canoeists and tubers can find an experience to fit their mood and ability level. The upper Jackson River is wild and scenic and may include some moderate class II or III rapids depending upon water levels. The Cowpasture River is generally an easy and enjoyable float popular with families. Of course, Lake Moomaw and Douthat Lake offer totally different paddling experiences. You can take your time and explore every peaceful cove. Campsites with water views can be found at both lakes. Floating on the water is just one option for enjoying the Alleghany Highlands Blueway. Anglers love the cool mountain waters and spend their days reeling in largemouth bass, trout, muskie and a dozen other kinds of fish. In addition to the two lakes and two main rivers, many other tributaries and streams flow through the mountains. You can even cast in the shadow of one of Virginia’s most famous icons. For those who aren’t ready to climb into a boat, enjoy a picnic or a stroll along the banks of Dunlap Creek near the famous Humpback Bridge. The historic bridge, built in 1857, is part of a wayside park that has picnic tables and plenty of parking. Humpback Bridge is the last remaining bridge of its design in the United States. Visitors from all across America come to see Humpback Bridge. In the Alleghany Highlands, they can admire history over the water and enjoy good clean fun paddling, tubing and fishing in the water.